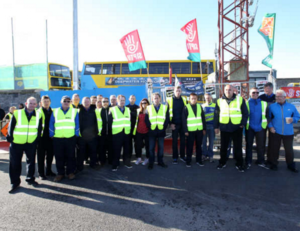 At the Broadstone bus depot for Dublin Bus in Dublin 7. 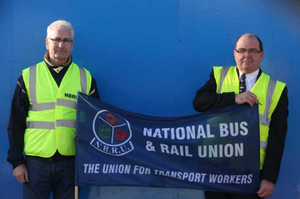 Dublin Bus workers – including Noel Fagan and Inspector Peter Duffy of the National Bus and Rail Union (top pic) – picket outside the depot on the second day of the latest 48-hour Dublin. • 48-hour stoppage on Tuesday, September 27 and Wednesday, September 28. • 24-hour stoppage on Saturday, October 1. • 24-hour stoppage on Wednesday, October 5. • 24-hour stoppage on Friday, October 7. • 24-hour stoppage on Monday, October 10. • 24-hour stoppage on Wednesday, October 12. • 24-hour stoppage on Friday, October 14. • 48-hour stoppage on Tuesday, October 18 and Wednesday, October 19. • 24-hour stoppage on Monday, October 24. • 24-hour stoppage on Wednesday, October 26. • 24-hour stoppage on Saturday, October 29. 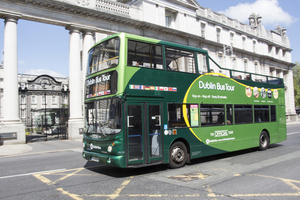 Posted in Misc and tagged Dublin Bus, Strike at 12:54 pm on September 16, 2016 by Broadsheet. Riding around in a fossil fuel powered metal box is archaic..
agreed, i was alluding to the fact that refunds for change tickets should be done online/ through an app. Privatise it and sack the lot of these union parasites. Yeah! Why should anyone want a proper wage that they could support a family and buy a home on? That’s just silly. Great idea! And if your grand and granddad live on an unprofitable bus route that gets stopped, they can just spend their entire tiny state pension on taxis! Or live as a hermit because old and poor people shouldn’t be seen by anyone. If they’ve got a problem with it they can just start an online petition like the rest of us. Problem solved. ah yes, because there is no other solution. So throw one out there. Do you really think spending taxes on taxis (copyright) for one or two people is going to cost the state (that’s you and me) less than spending it on busses for 20 to 60 people? It costs me €3 odd to go to town on the bus. €30 plus in a taxi. You sure? @Paps that’s a particularly daft suggestion. Privatisation of the buses would be a disaster. Same way the bins were. Some things just need to be state owned/controlled/subsidised. On Conyngham Road the protestors are parked dangerously on double yellow lines, thus blocking the cycle lanes. They don’t need to strike. I remember maybe 10 years ago, the bus drivers refused to take payment for the journey. 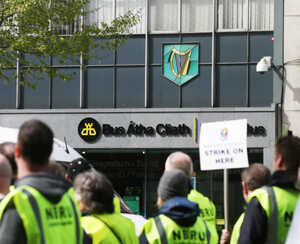 This meant that the bus drivers kept the public on side but still managed to get their point across to senior management. Sack all drivers. Easily replaced. Low skilled job.